I continue to spend time reading and pondering Bobby McGee’s Magical Running, a wonderful book on the mental aspects of training, racing, and dedicating time in your life to physical pursuits [note: all of this absolutely applies to the career world]. It’s been nice to supplement physical training with mental work as well. At the end of the day, fitness will only get you so far through a marathon, the rest is all in your head. Almost everyone has goals. They’re a critical, nigh essential part of life. It’s not news, to me anyway, that the primary fulfillment from goals is driven by the work, the striving, the grind to get there, not achievement of the goal itself. When you set yourself a big, hairy, audacious goal, one that is so mind-blowingly out of your current capabilities that it makes you shiver, that is when the fulfillment from the goal shines, as you whittle and chip away, removing the roughness and adding polish and function and new strength. The satisfaction and pure joy is truly found in the journey, not in the achievement. Goals and targets, as defined by McGee (p. 64). 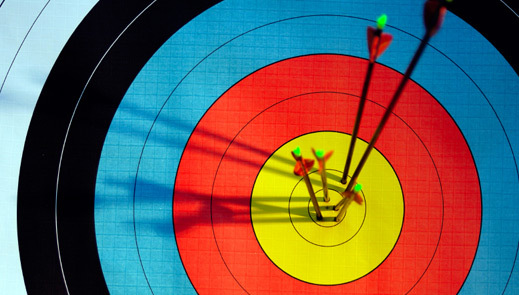 Targets – “Something we physically want;” an outcome that can be measured, like time to complete a race. A target serves as a directional beacon to give you a heading towards something. If you hit or meet your targets, you will not have “arrived” or “won” in life, but rather you will have affirmation that your work has set you down the larger, long-term path called living. Goals – “Who or what we want to be;” the attitude we bring to the track, our outlook on life, how we approach difficult training sessions or unexpected bumps in the road. Goals bring expansion and growth as we line the course with various targets to be chased, but always with a bigger picture end in mind. An excellent goal for the year for me is to learn something from every single race, and to have fun at them all. It’s easy to think that we have control over our journey and the resulting outcomes, but we really don’t. As McGee points out, set your targets but then understand that a target is only as valuable as the process that they advance you through. It’s not easy emotionally when you miss a target, but appreciate the value from all that you learned as you pressed along down that path. The target doesn’t matter (it really doesn’t), but your attitude does! Great example – my target for a 10k last year was sub-40 minutes. I ran it in 40:08. To some, that could have been framed as a total failure but for me, I was thrilled. In all honesty, I thought that goal was way out of reach, which made it so much easier to write off eight seconds and call it a smashing success. This year, I will be spending time learning to release my death-grip on my expectations and to just go with the flow of the races I enter. I have my IRONMAN target times in my mind but my goal for the year is to finish every race and learn something from each. Come what may. How do you manage your goals? What about your targets? Are you being brave and daring this year? Quotes taken from Magical Running, 2000. Disclaimer: I went back and changed goals to target on my previous blog.